Sunderland vs. Chelsea : 7 May 2016. We bumped into a few Chelsea fans at the train station, then grew frustrated as our journey was delayed by a slow-moving train. The walk from the Stadium of Light metro station to the ground took around ten minutes. We found ourselves walking through the alleyways between red-bricked terraced streets. The white steel supports of the Stadium of Light were shrouded in mist. It might have been May, but it seemed like the month of November. There was no time to waste. We could hear the crowd’s muffled sounds from inside the stadium’s white casing. Deep inside there was a voice begging Chelsea not to score until we were in. It was a deep irony that even though I had been awake before the alarm at 3.40am, I would still miss the bloody kick-off. The eight or ten flights of stairs were eventually navigated and – deep breaths – we were in. I glanced up a TV screen inside the concourse. We had missed just eight minutes. I am a very rare visitor to Sunderland. I never ever made it to Roker Park. This would only be my third visit to the Stadium of Light. My first visit was in 1999, when a Kevin Phillips hat-trick helped inflict a 4-1 defeat on the boys. In 2009, the last game of the season, we won 3-2 in a game which brought me a fair bit of pride at the time; it marked the first time that I had watched all thirty-eight league games, home and away, the full set. On that day, while we were battling Sunderland, their fierce local rivals Newcastle United were losing at Aston Villa, a result which relegated the Geordies. I can well remember the home fans booming with joy when they heard the Newcastle result. Damian Duff, if I am not mistaken, assisted in the loss, scoring an own goal. In 2016, seven years on, fate had transpired to replicate the set of fixtures. Aston Villa vs. Newcastle United. The joke during the week had been that Chelsea would win at Sunderland, Newcastle would win at Villa – of course – and we would get back to a jubilant Newcastle town centre, where friendly locals would buy us drinks all night. Before these two twin games, we heard that Norwich City – the other protagonists attempting to avoid the relegation trap door – had narrowly lost 1-0 at home to Manchester United. I wasn’t exactly sure of how that left things. At one stage it appeared that our weekend on Tyne and Wear might well be a “so long farewell” to the region’s two teams. Now, with Norwich looking unlikely to avoid the drop, the script had further changed. I shuffled along the row to stand beside Alan and Gary, with Parky soon joining me. Our away end seemed pretty full. It was a good showing. In the previous two visits, the away section was in the southern end; the single tier. In 1999, to the left, in 2009, to the right. Since then, shades of St. James’ Park, the away crowd has been banished to an upper tier, behind the goal to the north. It was a fine view to be fair. The crowd was virtually a sell-out. A few pockets of empty seats around and about, but a good show by the locals. Sunderland in their famous red and white stripes, black shorts and black socks. Chelsea – keeping it simple – in the traditional blue, blue, white. Time to quickly scan the starting eleven. Courtois – Dave, JT, Cahill, Brana – Matic, Mikel – Willian, Fabregas, Hazard – Diego Costa. In 2014/2015, this would have been regarded as our strongest starting eleven. This season, we have been wondering why the same eleven have rarely showed up en masse. What a year it has been. Just as I was settling, getting my bearings, warming up my vocal chords, we pushed deep in to the Sunderland box, and Diego Costa picked up a loose ball down below us. An instinctive shot at goal – one touch – had Mannone beaten. As easy as that, we were 1-0 up. How nice of the boys to wait until we had settled in before scoring. The game opened up a little, with Chelsea in the ascendancy, but there were a number of half-chances for both teams. Ivanovic zipped a low cross right the way past the goal, but there was no Chelsea body close enough to convert. Down at the far end, the Chelsea defence was well-marshaled by John Terry, and Courtois was able to gather any high balls lofted towards him. However, a free-kick was not sufficiently cleared, and it fell to USPA (Unknown Sunderland Player A). Although a long way out, USPA steadied himself, and took a swipe at the ball. We watched mesmerised as the ball flew into the Chelsea goal. Bloody hell. What a goal. I didn’t applaud it, but I felt like doing so. It brought me no satisfaction to see USPA – Wahbi Khazri, I think I prefer USPA – celebrate with the home fans, who hadn’t been as loud as I had expected until then. It ignited them, but we were soon back on top. Just a few minutes later – deep in to injury time in fact – Sunderland’s defenders were at sixes and sevens, allowing Dave to set up Matic. He had not had a great first-half, in the same way that he has not had a great season, so it was odd to see him calmly advance and slot home. We celebrated wildly, while he was mobbed by his team mates below us. Phew. We rode our luck a bit, but in we went at the break. Those free drinks back in The Toon were on my mind. Meanwhile, a few hundred miles to the south, it was 0-0 at Villa Park. We began the second-half in relatively fine fettle. We dominated possession, and looked at ease. However, time and time again, we seemed intent on taking one extra touch, and one extra touch especially in front of goal. We were getting behind the Sunderland defensive line, and creating a few chances. Hazard seemed to be full of tricks, and set up Diego Costa, but his shot was blocked by the ‘keeper. Another lovely move, reminiscent of our play from last season, involving Hazard and Fabregas, and then Diego Costa, had us all on our feet, expecting a goal. Although I was stood in the first half, now I was sat, resting my feet. It had been a long old day. I had already been awake for more than twelve hours. I was awake before the alarm sounded, and awake even before the dawn chorus. Our early-morning flight from Bristol to Newcastle seemed ages ago. Our singing wasn’t great as the game went on. There was one song which dominated, and – if I am honest – it is starting to annoy me a little. Frank Lampard. Two hundred. West Ham United. Sunderland weren’t giving up, and they grew stronger. I noticed that Branislav Ivanovic was on the floor on the half-way line, and it was easy to spot that a few Chelsea players were distracted. As the move developed I sensed fear. Patrick Van Aanholt – when he first broke in to our team, I rated him more than Ryan Bertrand – was able to pull the ball back for Fabio Borini – another former Chelsea player – to strike. Courtois, not exactly flavour of the month in the away section, seemed to react slowly, and the ball half-heartedly, apologetically, squeezed past his late dive. Hiddink replaced Ivanovic with Baba Rahman, with Azpilicueta switching to right back. Within a few seconds, we were all regretting the substitution. A rash, poorly-timed challenge by Baba, set USPB – DeAndre Yedlin – up to cross from the right. We again sensed fear. A deflection set the ball up perfectly for Jermaine Defoe to smack home. The Stadium of Light boomed. I watched as the folks sitting in the front row of the main stand to my right– plus those on the Sunderland bench – jumped to their feet and raced a few yards ahead, energised and electrified. I knew how they felt. On Monday, we had felt the same against Tottenham. Hiddink replaced a very quiet Willian with Oscar, and Mikel with Traore. We still kept pressing, but a goal never ever seemed likely. Baba continued to make hopeless, ill-timed challenges. I want him to do well, but he looks so green it hurts. Our play stalled. We lost all drive. The mood among the away support was deteriorating with every minute. Bloody hell, Chelsea. Things would get worse still. I had missed Gary Cahill’s booking in the first minute. I witnessed John Terry’s booking on the eighty-seventh minute. Both players stayed on the floor. Thoughts whizzed through my head. There had been no news about a contract extension over the past few months. The silence had been deafening. No news from the club. No news from Antonio Conte. No hint of another year. Silence. Damned silence. A red card. A two game ban? We had – surely – just witnessed John Terry’s last-ever game for Chelsea Football Club. I watched through my telephoto lens as he walked, stony-faced, past Hiddink and down the tunnel. The game ran its course. It was a horrible loss. After the euphoria of the draw against Tottenham on Monday – football at its best, Chelsea at our best – we stood disbelieving at the lack-lustre show from the team in the second-half. Outside, with the wind bitterly biting at us from all directions, we met up, and began a slow march in to Sunderland town centre. Alan and Gary were due to catch the subsidized Chelsea special back to London at 6.45pm, so we decided to share a couple of pints with them in a central pub. Sunderland fans, of course, were boiling over with joy. We edged past the lovely statue of Bob Stokoe – Wembley 1973 – and then out on to the main road. The bridge over the River Wear, a poor man’s version of the grander one over the Tyne, was shrouded in mist. Whereas Newcastle is a grand city in every sense of the word – architecturally pleasing, an iconic and photogenic setting on that deep gorge, with fine shopping, nightlife, attractions – Sunderland pales by comparison. Its town centre resembles a ghost town. It is no wonder Geordies look down their collective civic noses at their near neighbours. Inside “The William Jameson”, we raised pints to John Terry. Reports came through of him throwing his armband down, of a two game ban, of this being his last game. How typical of this mess of a season. It was the perfect metaphor for the campaign. And how typical for John Terry too. Undoubtedly he has enjoyed a wonderful career at Chelsea; a fantastic leader, a respected captain, and well honoured in his time at Stamford Bridge. And yet. And yet. 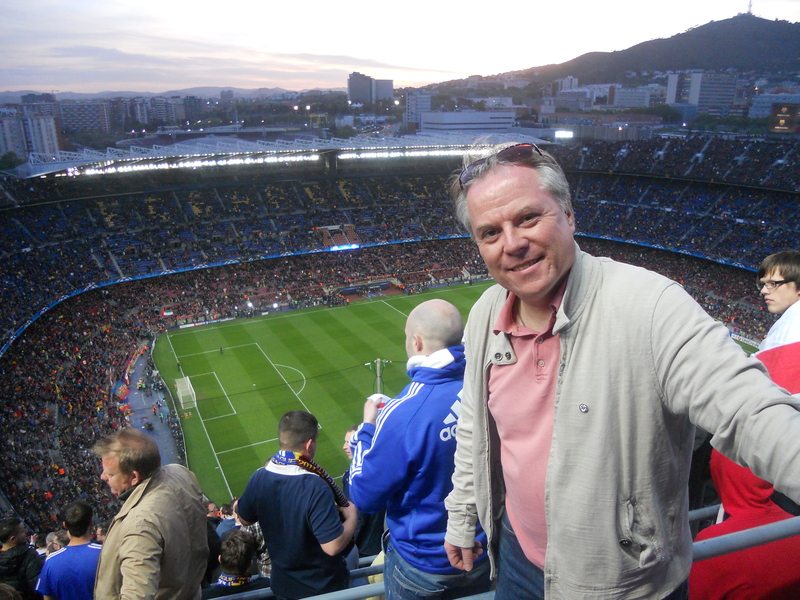 John missed our most famous game – Munich 2012 – due to an indiscretion in Camp Nou. He missed the Europa League Final too. His most famous moment, in some circles, was the infamous slip in Moscow. It has not been a career without blemishes. There have been indiscretions. And how typical, how Terryesque, that his Chelsea career would end with a sending off. There would not even be a grand finale at Stamford Bridge against Leicester City. Newcastle had only managed a 0-0 draw at Aston Villa. Sunderland were now in the ascendency. A win for them against Everton on Wednesday would keep them up. All of a sudden, I wanted the season to end. The trip to Anfield on Wednesday hardly enthused me; it would surely prove to be one of the least anticipated trips with Chelsea for ages. There would be the bittersweet last game of the season against the new champions, but I was ready for the summer. We said our goodbyes to Alan and Gary, then headed back in to Newcastle. There were laughs on the return journey, and the four of us were soon enjoying pints in a number of town centre pubs. Newcastle is such a fantastic city that our poor loss against Sunderland soon drifted away from our collective thoughts. “The Bridge Hotel” overlooking the river, and live action on the TV of Leicester City’s celebrations. “Akenside Traders” and an ‘eighties sing-song, and some Burnley fans celebrating a promotion. A quiet pint in the “Pitcher & Piano” overlooking the floodlit Millennium Bridge. Then up in to town and yet more drinks at “Sam Jack’s” and laughs with a few Chelsea fans out on the town. Then down to “The Rose & Crown”, with a karaoke, and a chat with a Leicester City fan – so happy – and a Brighton fan – so low after only a draw at ‘Boro. The lagers gave way to gin and tonics. Our chats became blurred. After a day in Tyne and Wear, we were getting a little tired and weary. The night continued but there were no free drinks for us Chelsea fans this time. In fact, I think I bought the Leicester City fan a drink, but it’s all a bit hazy. Ah, the madness of a night on the toon. 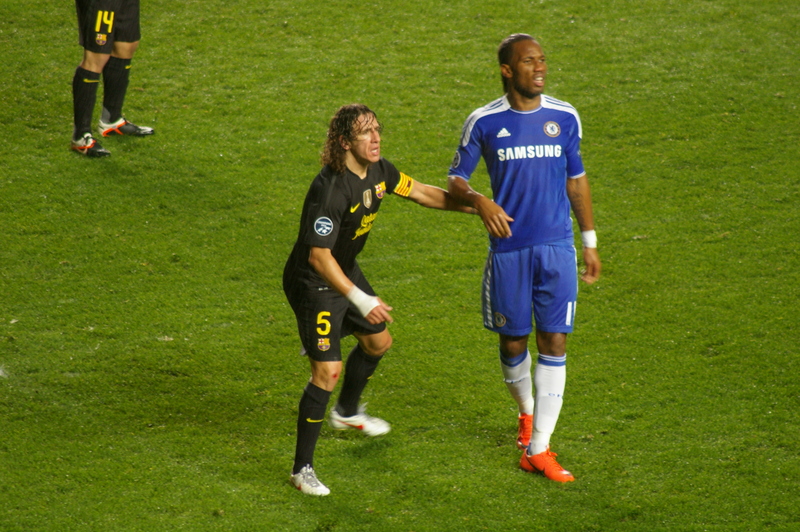 Chelsea vs. Barcelona : 18 April 2012. There is a delicious irony in Chelsea’s recent love affair with the Champions League over the past ten years. Way back in 1955, just after our first ever Football League Championship, Chelsea could have been the very first winners of the inaugural European Cup which was played during the 1955-1956 season. However, for whatever reason, the out-of-touch octogenarians in the English F.A. strongly advised the club to forego participation. Instead, Real Madrid won the first ever European Cup (and the second, the third, the fourth, the fifth) in 1956 and Chelsea had to wait until 1999-2000 to participate again. There have been few games which have produced the same “buzz” of anticipation than that first ever game against Milan in September 1999; a pulsating 0-0 draw at The Bridge was a classic. If only we knew then what we know now; we have since taken to the competition like the proverbial duck to aqueous solution. We reached the quarter-finals in that first season before losing to (guess who?) Barcelona. Since then, we have been one of European football’s top performers in the World’s premier cup competition. Our semi-final against Barcelona this season would be our sixth since 2003-2004. These have been heady days. Spring time at Chelsea has recently involved football on multiple fronts. It’s a beautiful period in our history; breath it in, let it fill up your senses, these days will not last for ever. 2004 – a defeat by AS Monaco, fresh on the heels of that game at Highbury in the previous round. Claudio Ranieri at his infuriating worst, tinkering to distraction, just to prove a point to the club management who had already hinted he would be leaving the following season. 2005 – a nauseating defeat to Liverpool. The result of Mourinho not “going for it” in the home leg, the result of the Luis Garcia “ghost” goal at Anfield. We were the best team in Europe that season, having discarded FCB in the quarters. 2007 – another hateful defeat to Liverpool, this time on penalties at Anfield after Joe Cole and Daniel Agger goals gave both teams 1-0 home wins. Again, Mourinho failed to attack Liverpool sufficiently. Would we ever get to the final? 2008 – joy unbounded as we drew 1-1 at Anfield and then won 3-2 at a pulsating Stamford Bridge on one of the most emotional nights that English football has ever witnessed. Frank Lampard inspired us and we were on our way to Moscow. 2009 – a resolute performance by Chelsea at Camp Nou and a 0-0 draw. A despicable performance by a certain Norwegian referee at The Bridge. Michael Essien scored his best ever goal, but Iniesta equalised with virtually Barca’s only shot on goal. Pure, unadulterated sadness. Our record in the Champions League semi-finals is therefore 1-4. Throw in our ridiculously close defeat in the final in 2008 and has ever a team come closer to winning the World’s greatest club competition, yet failing, than Chelsea? During the day, I pondered our chances for 2012 against the mesmeric talisman Lionel Messi and his Barcelona team mates. Not even our stupendous win against Tottenham on Sunday could dispel many of my very real worries and concerns. My biggest fear was that of humiliation. This has been a strange old season; our team was creaking under Villas-Boas, but has been rejuvenated under Roberto di Matteo. Our form has returned, yet we are still an old team in transition. In my mind, there was a real chance that this would turn out to be one game too far for the battle-scarred veterans. After our fortuitous refereeing decisions against Wigan and Spurs, I was also aware that all of our Lady Luck Tokens had been used for this season. And yet, I can easily recall a conversation that a few friends and I had in The Goose before that 2000 game against Barcelona; we had performed miracles during that CL season and we decided that we were realistically not going to progress further. That Barcelona team, including Figo and the like, was a class act. What did we know? On that incredible night we stormed into a 3-0 lead and produced a breath-taking performance. A late Figo goal took the edge off the night, but it had taught me not to write off Chelsea Football Club. I added that I thought that we had a 20% chance to progress to the final over both legs. These were my thoughts before the trip to London. I pulled out of Chippenham at 4pm. Parky and I were headed east once more. It was a drizzle-filled Wiltshire evening. I wondered if the extra zip to the pitch in London would assist Barcelona’s quick passing. As I approached Reading, my thoughts on the night’s game were waylaid; my friend Rob, who had been tasked to collect my ticket for the away game in Catalonia, called me on my phone. He was very agitated and told me that the Chelsea box office had no record of my purchase. Surely I applied for my ticket last week? For thirty minutes, I tried to recollect if I had bought the £73.50 ticket. It has been a busy old spell, with many match tickets needing to be purchased; maybe I had, indeed, forgotten to get one? I tried to call the box office, but they were closed. I mulled over my options. I realised that I could pop into the internet café opposite The Goose and apply there. Rob confirmed that the box office would be open for thirty minutes after the evening’s game for collections. I could relax. I parked up at 6.45pm. By 6.55pm, I had purchased my away ticket and Parky had bought me a pint of Peroni in The Goose. I thanked Rob for his efforts and he handed me back the form I had filled out detailing my travel details; I would need that to claim my ticket. I met up with Alex, a work colleague, who had asked me if I had the chance of getting him a ticket as soon as we had beaten Benfica. Alex works for one of the hauliers that my company uses to move our client’s products in Europe; he is from Vienna and has been working in England for a year or so. We had spoken on the ‘phone, but had never met before. He has no team in Austria; Chelsea is his team. He is typical of the new type of supporter our club has attracted of late; not from Ashford, but Austria, not from Cheam, but from California, not from Gravesend, but from Germany. He was clearly ecstatic to be able to see only his second ever Chelsea game. He was off back to Vienna in May. It was great to see him so happy. Alex and I rushed down to The Bridge; the half-and-half scarves sellers had been busy. I can understand the allure of a friendship scarf for European games; in fact, Parky often gets one for Jill. The St. George flag on the FCB badge always looks great in my mind. Monday is St. George’s Day, of course, and a few Chelsea fans will be celebrating our patron saint’s day deep in the heart of Catalonia. We reached our seats at 7.35pm just as Neil Barnett announced “the anthem”; the recording of “Blue Is The Colour” by an opera singer. I personally wish they would stick with the original 1972 recording to be honest; this new version is slightly too slow, slightly too forced. Alex and I scrambled up to the back row of the MHU and we pinned my two banners up. “Vinci Per Noi” dates from the summer of 1996. “Peter Osgood” dates from March 2006. The blue and white flags had been handed out once again and were being waved furiously as the last few bars of “Blue Is The Colour” gave way to “The Liquidator.” Then, the two teams strode out onto the wet turf, past the Champions League flag, on to the west side of the pitch. What a rushed pre-match. However, as I took my seat next to Alan and Tom, I took off my jacket and tried to settle down just for a few moments. I worked out who was playing for Chelsea a few moments into the game. The only surprise was Meireles; this just signifies how far Michael Essien is off his game. Chelsea were in blue, Barcelona were in black. In the far corner, the 3,000 away fans presented a vivid and varied scene. Not only were the FCB colours of blue and claret represented, but also the Catalonia colours of red and yellow. Lots of replica shirts, lots of scarves, lots of colourful banners draped over the balcony wall. Let battle commence. Let the nerves be tested. Let us play. Let us pray. Despite our wishful thoughts about us “taking it” to Barcelona, it soon became apparent that the away team simply took over the game, strangling us with possession, for us to enjoy any real periods of dominance. All eyes were on Lionel Messi, the World’s greatest footballer, who was there in person, no more than twenty yards away from me at times. I was transfixed by this little man – quiet, unobtrusive, walking around the pitch, head low. How could such a benign looking figure have the potential to cause us so much heartache? It all seemed to be about him. I followed his movement in and amongst our players, his movement at times no more than a slow walk. We would have to stifle his every move. Elsewhere, there were familiar faces, all equally-placed to cause anxiety to defenders and fans alike. Xavi, Iniesta, Fabregas. The Barcelona players pushed the ball around at will and the passes were usually inch perfect. Short passes were common, but even cross-field balls were inch perfect. In contrast, Chelsea chased and harried, closing down space, avoiding rough tackles. I got the impression that we were being slightly too reverential. I longed for a 50-50 challenge – not a dirty foul, no need to draw a booking – but a hard, strong tackle that would let Barca know we were serious. It would also help to involve the crowd. When I play five-a-side, I am not great a great tackler – I am more a nibbler, someone who can get a toe in to rob the opponent of the ball, someone who can read a pass and intercept. However, when the need arises and I can sense a pure 50-50, there is no greater feeling that hitting the ball and player’s leading foot together with a strong tackle. I longed for Chelsea to do the same. The first chance of the game fell to the men in black. Andres Iniesta picked out the on-rushing Sanchez, who nimbly beat the offside trap and delicately lobbed the ball over the ghostly figure of Petr Cech. “Here we go” I thought. We waited to see where the ball would end up – time stood still, that old cliché – and were mighty relieved to see the ball drop against the bar. Soon after, Messi’s first real involvement took him in to the penalty area with one of his breath-taking runs, the ball seemingly no more than six inches from his toes throughout. A Chelsea challenge could easily have sent another Barcelona player tumbling, but to his enormous credit, the little Argentinian stayed on his feet. He passed to Iniesta but his close-range shot was wonderfully parried by Cech. The rebound seemed to take Fabregas by surprise and we sighed again. On 19 minutes, a rare Chelsea chance resulted in Juan Mata slashing over the bar. Soon after, Barcelona were awarded a corner down below me. As Messi slowly walked towards the corner flag and stooped to collect the ball, more than a few Chelsea fans in the MHU clapped his appearance and I was suitably impressed. We don’t usually do this sort of thing in England – apart from inside cricket grounds where opposing “boundaries” are often clapped by opposing fans – and this was a sure sign that the Chelsea public recognised talent when they saw it. Messi – so young, but so great – is already knocking on the door of Pele and Maradona. Drogba was putting in a typical performance; strong in the air and winning defensive headers one minute, rolling around like he was the victim of a sniper’s bullet the next. He was clearly disrupting Barca’s flow, though whether he had been told to do this by club management is a moot point. I suspect not; I suspect it comes natural to him. I had hoped he could channel the frustration he felt after the 2009 “it’s a fcuking disgrace” game in the right way. However, despite his physical strength, he wasn’t a threat offensively and we were getting a little annoyed with his antics during the game. The sky filled with misty rain as Barca passed the ball at will. The otherwise dependable Mikel lost possession amidst growls of discontent and the mercurial Messi set up Fabregas. His goal bound effort flew past Cech but slowed slightly, allowing the excellent Ashley Cole to back-pedal, re-adjust at the last minute, and hack the ball to safety with his favoured left peg. And then, at 8.32pm – a text to Del. Oh boy…one shot on goal, one goal, one delirious Stamford Bridge. At the break, Jimmy-Floyd Hasselbaink was on the pitch, and Journey were on the PA.
“Don’t Stop Believing” is a totally incongruous song to be played at a football ground in England; it certainly says nothing at all about our life as UK Chelsea fans. But I can understand why the club chose to play it. The second-half performance by Chelsea will go down in the annals of our club as one of the most resolute and brave performances the spectators at Stamford Bridge has ever seen. Barcelona began again strongly. Adriano drew a superb save from Cech. Sanchez shot inexplicably wide of Cech’s post. Alves blasted over. Block after block – Cahill, Terry, Mikel – stopped Barcelona’s goal-bound efforts. Despite his detractors, even Meireles was putting in a solid shift. The only player under-performing was Juan Mata, but he is not built for defensive duties and can hardly be blamed for the game passing him by. Barcelona enjoyed several centrally-placed free-kicks, but shots were either blocked (Messi) or ballooned over (Xavi). This was proving to be almost too difficult to watch; it was certainly too tense to enjoy. I was still in my shirt-sleeves. I avoided putting my jacket on as I superstitiously thought it would jinx things. When I was a kid, watching games with my parents, I had the same superstition with chewing gum. If we were winning, I’d keep the same piece of gum in my mouth. If we were losing, I’d discard it. “Chelsea – Chelsea – Chelsea – Chelsea. Chelsea – Chelsea – Chelsea. Chelsea – Chelsea – Chelsea – Chelsea. I was amazed how quickly I felt the time was going…60 minutes, 65 minutes, 70 minutes. The manager replaced Kalou for Mata – fresh legs. The Barcelona pressure continued. Our only chances in the second period involved a Frank Lampard corner, whipped in, but avoiding the trio of Chelsea players at the far post and a break involving a great pass from Drogba finding Kalou who dinked over Valdes’ bar. Another Messi free-kick with five minutes remaining. He chipped the ball in towards Puyol, who flicked the ball on with the deftest of touches. I was right in line with the flight of the ball as it bounced up towards the goal. It was surely the equaliser. Out of nowhere, Cech scrambled across to turn the ball away for a corner. Superb. The save of the match. Bosingwa on for the magnificent Ramires – more fresh legs. The assistant linesman signaled just three minutes of time to be added on. I looked at my phone and it was 9.33pm. 9.36pm and we’re halfway to paradise. Time for one last agonising moment as Messi moved the ball out to Pedro. He was well outside the box, at an angle, but his low drive avoided all players in the packed penalty area and struck Cech’s far post with a dull thud. The ball rebounded out to Busquets, who ballooned it high into the Chelsea fans in The Shed Upper. The Bridge roared and Alan, Alex and I smacked each other’s backs. I, for one, could not believe it. I had just witnessed a miracle. Of course, we had ridden our luck, but what a gutsy performance. I lost count of the number of blocks which our defenders used to thwart Barca. I was breathless and almost light-headed as the players clapped the crowd from the centre-circle. There was no overblown triumphalism from the team at the end. They knew we were only half-way there. But we have a foothold in this tie and we will, I am sure, go out to Barcelona with a plausible reason to be optimistic of our chances. “One Step beyond” got us all bouncing. I skipped past the Peter Osgood statue – I made the point of touching his leg as I passed – and quickly joined the line of around 100 fans collecting Barcelona away tickets. With great relief, I was handed my ticket. I met up with Steve from the NYBs, who was close to tears with emotion. The London night was now dirty and wet with rain, but inside our heads we were drugged-up with Chelsea. We met up with Parky and Jesus in The Goose to let the traffic subside. Rob and Les from nearby Melksham were enjoying “one last pint” and these two scallywags will be on the same 6.55am flight from Bristol as me on Tuesday. What a beautiful night in Catalonia that could be.